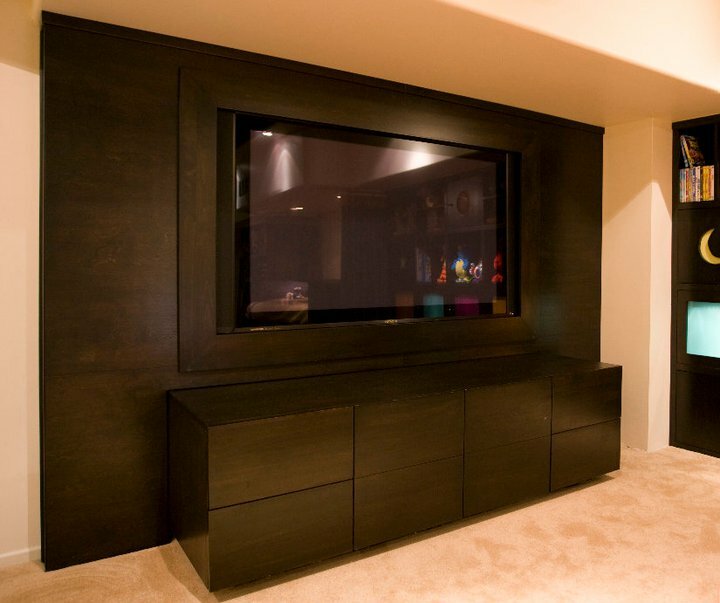 Creating this custom designed wood entertainment center turned out to be one of our very favorite projects — kind of from start to finish. Our client wanted something that would make the most of the space, and feel glossy and sumptuous. Once we decided on the scope of the project, I took measurements and sketched up a hand drawing, based on our discussion, and together, we came up with an elegant, contemporary design. One of the benefits that comes with working with a musician is that I have a very clear understanding of electrical gear. It’s crucial to design with those needs in mind from the get-go. Electrical equipment heats up, so it needs ventilation. I plan our pieces with the gear in mind. After all, we want our clients to be happy with the UFM Designs process. There are usually multiple cables for each component. You need to plan for discrete openings and spaces to connect all of your devices, and to do so without your finished product looking like it’s supporting a heart transplant patient. You’ll notice as you look at this piece, that there are no protruding cables or wires anywhere. What you have is a sleek, modern media center. One more thing — some companies charge extra for the little touches that make using the furniture we create pure pleasure, but they’re standard issue in all the gear we build. For example, the 4 side drawers are all on full extension glides. And, each door is on a push latch system. No need to Macgyver anything we produce.